The Fantastic Four depart from the Great Refuge in the Himalayas, but almost immediately are faced with the coming of Galactus, heralded by the Silver Surfer. Galactus devours entire planets to fuel his life-force (some reports suggest that Galactus also destroys planets with humanoid life because the Celestials typically implant those planets with a Celestial embryo). With the Watcher’s help, the Torch retrieves the solar-system-destroying "Ultimate Nullifier" from Galactus’ ship and Galactus is repelled for the time being, but the Silver Surfer is banished to Earth for aiding the humans. Johnny Storm befriends the American Indian-descended Wyatt Wingfoot on his first day at Metro College. 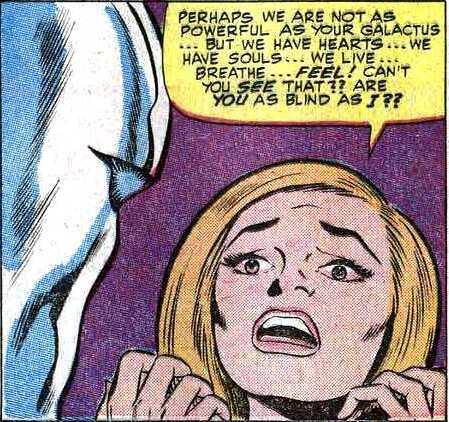 Reed Richards invents a portal to access the Negative Zone. 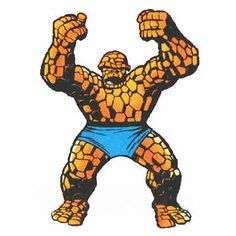 A scientist switches bodies with Ben Grimm, but when Reed is trapped in the Negative Zone, he sacrifices himself instead to save him. The FF meet T’Challa, the Black Panther, the prince and totem-protector of the super-technological city of Wakanda. Wakanda also holds a large mound of the rare super-absorbent metal Vibranium. The FF and the Black Panther are soon menaced by Ulysses Klaw, killer of T'Challa's father and who eventually becomes transformed into a being of living sound. The FF encounter what appears to be the original Human Torch created by Prof. Horton. Dr. Doom gains the Power Cosmic from the Silver Surfer, but Reed tricks him into challenging Galactus’ barrier that imprisons the Surfer to the Earth. The Avengers encounter the Collector (whose actions are later claimed to be designed against the coming of Thanos). Henry Pym rejoins the Avengers as Goliath. The Wasp follows suit. Thor battles the Olympian gods Hercules and Pluto (God of the Netherworld). The Odin-Power is stolen by a scheming advisor and only by threatening to let fall the Odinsword does Thor compel the return of the power to Odin. Thor meets the super-geneticist, the High Evolutionary and the artificially-evolved Knights of Wundagore. They battle the evil Man-Beast, after which Wundagore leaves Earth for space. The Asgardians battle Fafnir the dragon (time unknown). Rick Jones reveals that Bruce Banner is the Hulk. The Hulk is caught in the middle of a subterranean war between the Mole Man and Tyrannus. Meanwhile, the Secret Empire (a subdivision of Hydra) surfaces and sends Boomerang after the Hulk. Happy Hogan is accidentally transformed into the Freak. Iron Man battles the Mandarin's giant robot, Ultimo. Happy Hogan aids Tony Stark by temporarily impersonating Iron Man, and is kidnapped by the Mandarin by mistake. Captain America first encounters the French criminal, Batroc the Leaper, as well as Sharon Carter, Agent 13 of SHIELD, with whom Cap will later develop a romantic relationship. Nick Fury and Captain America finally reunite since the end of WW II, only to encounter the machinations of the evil scientific organization AIM (Advanced Idea Mechanics), another subdivision of Hydra. Fury gives Cap a SHIELD priority badge. wish-granting Cosmic Cube, but is defeated by Captain America's superior tactics. Cap meets the robotic Super-Adaptoid, created by AIM from a sliver of the Cosmic Cube. Hank Pym meets Bill Foster (later Black Goliath). The Avengers fight the race-motivated Sons of the Serpent. The Black Widow begins aiding the Avengers. Agent Jasper Sitwell joins SHIELD's inner circle. Nick Fury turns his attention to AIM's main forces. Unfortunately, HYDRA soon returns. Daredevil encounters Ka-Zar in the Savage Land and meets Ka-Zar’s brother the Plunderer. The two brothers battle for ownership of the Plunder Stone. Daredevil battles Melvin Potter, the costumed Gladiator, who mistakes Foggy Nelson for Daredevil. When Aunt May gets sick, Spider-Man pushes his strength to the limit to free himself from being trapped under wreckage. Norman Osborn appears when his factory is damaged by rival Dr. Stromm. Spider-Man & Osborn (the Green Goblin) discover each others’ secret identities. Spidey first encounters the horns of the Rhino. Peter Parker "hits the jackpot" and meets Mary Jane Watson face to face. He later asks to join the Avengers and they have him tackle the Hulk as a test. He changes his mind after a misunderstanding. The X-Men meet the Mimic, who briefly joins the team. Dormammu challenges Eternity but is hurled into another dimension. Clea and Baron Mordo are freed from Dormammu's banishment, but so are Kaluu and Umar. Dr. Strange battles the Ancient One's ancient rival, Kaluu. Strange encounters the wrath of the Unspeakable Umar, Dormammu's sister, who strikes at him by re-banishing Clea. The Ancient One saves Clea by using the Spell of Vanishment on her, after which he and Strange free the Eternity-bound Zom, which causes Umar to flee Earth. The Ancient One passes his power to Dr. Strange so that Strange can in turn defeat the evil Zom. 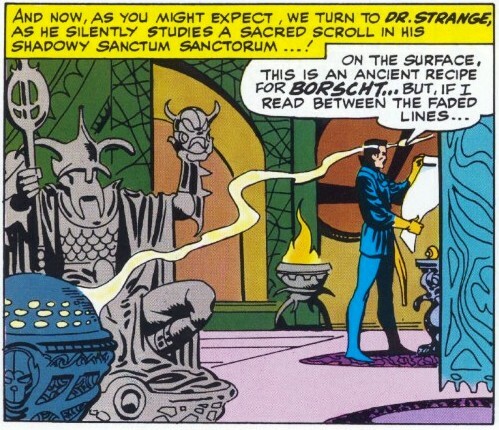 Unfortunately, Strange's defeat of Zom upsets the balance of evil in the dimensions, causing the Living Tribunal to judge Earth too dangerous to exist. Strange vows to restore the balance and the Living Tribunal gives Earth a short reprieve.